In a joint announcement today by the Canadian Curling Association (CCA), U.S. 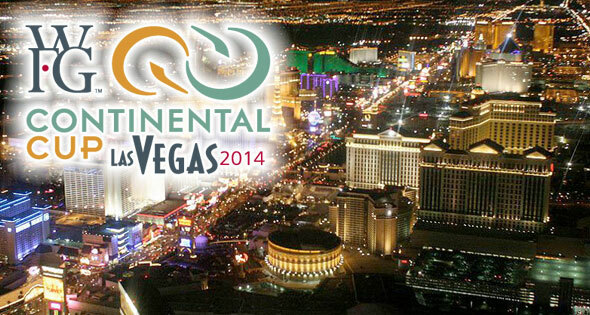 Curling Association (USCA) and World Curling Federation (WCF), it was revealed that the 2014 World Financial Group Continental Cup will be staged here January 16-19 at the 5,000-seat Orleans Arena, home to hockey’s Las Vegas Wranglers of the ECHL. It marks the first time that the event will be held in the United States and the first time outside of Canada. It also will be the first time that Las Vegas has hosted a curling event of this magnitude. The WFG Continental Cup is a unique, Ryder Cup-like competition pitting six (four-person) teams (three women’s and three men’s) from North America (two from USA, four from Canada) against six teams representing The World, in a variety of curling disciplines over a four-day period – Team Games, Mixed Doubles, Singles, Skins and Mixed Skins, with each segment worth a specified number of points. Each side will also have a captain and a coach. Presently, North America and The World are deadlocked at four wins apiece since the inaugural Cup in 2002 in Regina, Saskatchewan. “Las Vegas is one of the iconic destinations in the world,” said World Curling Federation President Kate Caithness. “The World Curling Federation and its partners, the World Financial Group, the Canadian Curling Association and the U.S. Curling Association, are thrilled to be able to showcase the sport of curling and its top international players in such a high profile location just ahead of the 2014 Olympic and Paralympic Winter Games. The 2014 edition will also mark the fourth year of title sponsorship by World Financial Group, which is also a full sub-sponsor of the CCA’s Season of Champions through the 2013-14 season. “The World Financial Group Continental Cup continues to build momentum and demonstrate its special place in the sport of curling,” explained Greg Stremlaw, Chief Executive Officer of the Canadian Curling Association. “This international event is undergoing some exciting format changes this January in Penticton and to further accentuate the profile of the event, we have worked closely with our partners at the United States Curling Association and the World Curling Federation to find a model that will work for this prestigious event to be held in Las Vegas – with all the glitz and glamour that come with such a wonderfully unique setting. “The stars have finally aligned. The many years of effort by countless people are finally paying off, and I’d say the odds are that this event will be a winner in Las Vegas,” said Rick Patzke, Chief Operating Officer of the United States Curling Association. Event tickets are expected to go on sale in early 2013. “WFG is proud to be partnered with the CCA and title sponsor of the Continental Cup,” said Richard Williams, President, World Financial Group Insurance Agency of Canada and WFG Securities of Canada. 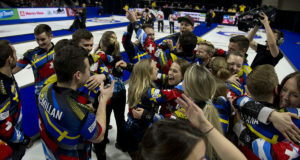 Canada’s teams will be the winners of the upcoming Capital One Canada Cup, November 28-December 2 in Moose Jaw, Saskatchewan, along with the winners of the 2013 Scotties Tournament of Hearts and 2013 Tim Hortons Brier, the Canadian women’s and men’s championships, respectively. The teams representing the United States may very likely be those that will compete for USA at the 2014 Olympic Winter Games in Sochi, Russia a few weeks following the Continental Cup. Teams representing The World will be determined from the results of the 2012 Le Gruyère European Championships in December in Karlstad, Sweden, the 2013 World Women’s in Riga, Latvia and Ford World Men’s in Victoria, British Columbia. North America has won the Cup in 2002 in Regina, 2004 and 2007 in Medicine Hat and 2011 in St. Albert, Alberta, while Team World emerged victorious in 2003 in Thunder Bay, Ontario, 2006 in Chilliwack, BC, 2008 in Camrose, Alberta and 2012 in Langley, BC. The 2013 WFG Continental Cup is slated for Penticton, British Columbia, January 10-13. There will be a revamped points system in place for this edition, with a total of 60 points (instead of 400) now available from all of the segments. The first side to reach at least 30 ½ points will be declared the winner. 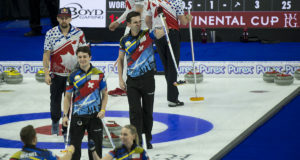 The world’s best curlers have participated in past Cups – skips such as Olympic gold medalists Brad Gushue, Russ Howard and Kevin Martin of Canada, Sweden’s Anette Norberg, Norway’s Pal Trulsen and Great Britain’s Rhona Martin to world champions Colleen Jones, Kelly Scott, Jennifer Jones, Kelley Law, Randy Ferbey, Kevin Koe, Glenn Howard and Jeff Stoughton of Canada; Norway’s Dordi Nordby, Scotland’s Jackie Lockhart, Hammy McMillan and David Murdoch, Germany’s Andrea Schöpp, China’s Bingyu Wang, Debbie McCormick of the United States, Switzerland’s Mirjam Ott, Sweden’s Peja Lindholm and Elisabet Gustafson, along with Olympic silver medallist Thomas Ulsrud of Norway. Ticket and travel packages for Canadian visitors will be made available in January, with details posted on both the event and CCA websites. TSN, Canada’s leading sports network, along with French language sports network RDS, will televise all of the action from Las Vegas. Outside of Canada television details have yet to be finalized. The World Financial Group Continental Cup is a joint venture of the Canadian Curling Association, United States Curling Association and the World Curling Federation. Previous: Depuis quand y a-t-il des officiels au curling ?